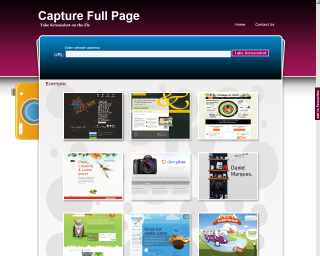 Here's the list of tools that can help you create or capture website snapshots online without the need of downloading and installing softwares. Shrinktheweb captures images very fast.Using this web app you can generate 8 different sizes of website thumbnails.No registration required.You can capture and customize images also.After selecting required size you have to click "customize my link" button , right click the image and select "save as" option to download it on your pc. Using this web application you can capture full page and full screen in png format.While most of the free websites in this category offers above the fold screen capture only, using this web service you can take screenshot of whole webpage.Just type the web address ,select page or screen and click on thumb it. You can download six predefined sizes or choose custom width. This is one of the best free screen capture service i have seen so far with a lot of additional features which other online screen capturing services do not have.Using aviary you can take screenshot of a website,customize,edit with editor and save it to the clipboard,pc or online. 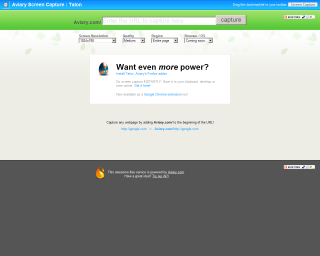 This web service also providing top screen and full page screeshots with six different sizes. 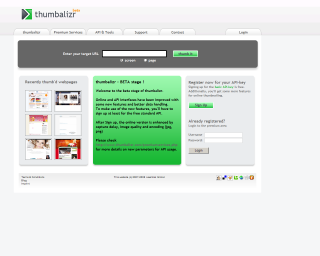 FullI (1280px),Large(1024),Medium(800px),Small(640px),X-small (320px)and icon(80px) size thmbnails. 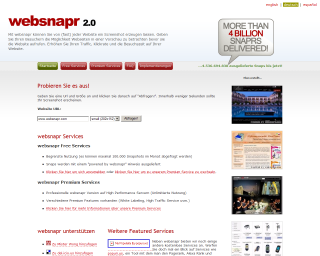 Using this web you can capture small (202x152) and micro (90x70) website snapshots with "powered by websnapr" branding. Registered users can take 100.000 free snapshots per mont. If you take tiny (80 x60) regularly this web service suits for you.Free users can take upto 75000 website thumbnials per month but they delivered with "Powered by SiteThumbshot" branding.